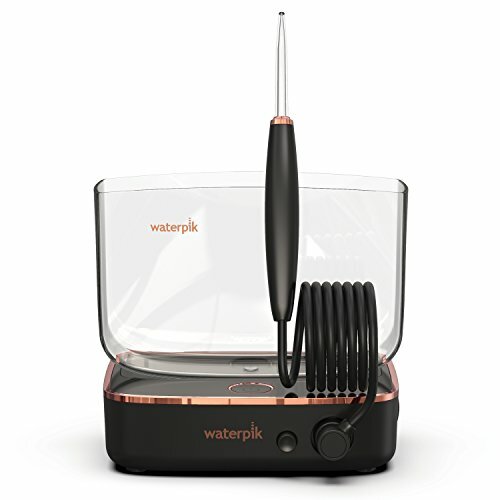 Featuring an ultra-compact and convenient design, the Waterpik Sidekick Water Flosser makes it easy to water floss anywhere, anytime. The Waterpik Sidekick is ideal for bathrooms with limited counter space - it collapses easily for storage and fits in almost any purse or briefcase for travel-ready water flossing. It comes with a new easy-to-hold flossing stylus with integrated classic tip and swivel handle for effortless access to all areas of the mouth. The easy and most effective way to floss, the Waterpik Sidekick delivers all the clinically proven benefits of Waterpik water flossing. It cleans deep between teeth and below the gum line to remove harmful bacteria and debris that traditional brushing and flossing can't reach. And it removes up to 99.9% of plaque from treated areas. It includes a premium storage case, flossing stylus, 13 ounce (400 ml) water reservoir, slide-in wall-brick with global voltage (100 240VAC, 60/50Hz), and 3-year warranty.